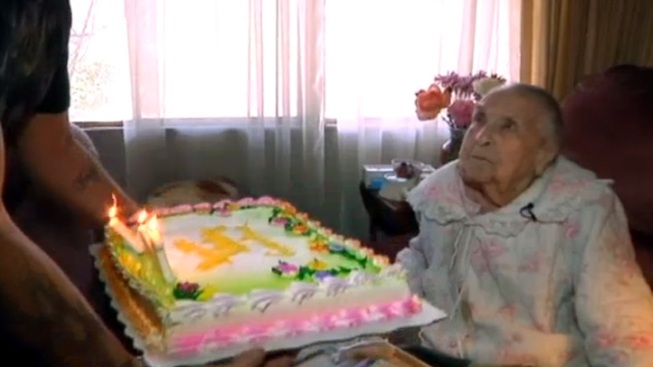 Esther Babcock's friends and relatives from all over the country came back to Corona Sunday to celebrate her 104th birthday. “It’s not very often when you have a great, great, great grandmother that’s 104 years old," said Kyle Routhiaux. That's exactly what Kyle has, though. Babcock, born on April 18, 1908, will turn 104 this week. "If we couldn't walk, my dad had an old Ford Model A," she said. "We were one of the few families that had a car." Esther says her family was one of the first to settle in the Inland Empire. She says her grandfather became the first assistant police chief of what was then the tiny town of San Bernardino. Now she lives in Corona. Her family members, generations of them, have spread out across the country. A lot of them made their way back to the Inland Empire for Sunday's party. It created the atmosphere of a family reunion. “I’m glad I have such a good-looking grandson,” she said, gesturing to one of her many progeny across the room. They all had plenty to talk about, just verifying their relationship to the woman of honor. As the party wound down, Esther left her loved ones with a blessing and a wish. “That all my family will be well and healthy," she said, "and rich," she added emphatically.